Perhaps being more known as the home of the Braves, Atlanta Fulton County Stadium was the home of the Falcons for more than two decades. Construction of a stadium in Atlanta was first discussed in the 1930s. However, the first major proposal for a stadium came in 1956. A domed stadium was first mentioned, but that idea was dropped. Both AFL and MLB teams looked at Atlanta as a possible city to move to. But with the city’s slow pace in constructing a stadium, teams looked elsewhere to relocate to. However, on March 5, 1964, the Milwaukee Braves (MLB) decided to move to Atlanta if a stadium was completed by 1966. With this announcement, construction began immediately on a new stadium on April 15, 1964. Once Atlanta committed to building a stadium, the NFL awarded the city a franchise on June 30, 1965. Constructed in 51 weeks the stadium was ready by the 1965 season. However, Atlanta’s new team, the Falcons would not play at the stadium until the next year. Atlanta was one of the first cities to build a “cookie cutter” multipurpose facility that could house both football and baseball. The Falcons shared Atlanta Stadium with the Atlanta Braves who moved to Atlanta for the start of the 1966 baseball season. The first football game ever played at Atlanta Stadium was between the Minnesota Vikings and Pittsburgh Steelers on August 14, 1965. The Falcons made their debut at the stadium on August 27, 1966 against the San Francisco 49ers. Later renamed Atlanta Fulton County Stadium, the stadium had a football capacity of 60,000. Three tiers of blue wooden seats circled the entire grass field. In order for the stadium to be transformed to a football field, seats which would have been located in right field during a baseball game were pushed behind the grandstands in order to make a football field. Atlanta Fulton County Stadium underwent few many changes during its existence. In 1977, the stadium was given a new look, with new seats. All of the wooden blue seats were replaced by blue, orange and red plastic seats. A new scoreboard/ video board was placed below the stadium roof. The stadium remained the same until it closed. Beginning in 1984, a new stadium for the Falcons was discussed. The Falcons wanted a new football only facility, because they no longer wanted to share the stadium with the Braves. By 1988, talks intensified of building a new stadium and in 1989 approval came from the state, the Atlanta City Council and Fulton County Commission to build a dome stadium. The Atlanta Falcons played their last game at Atlanta Fulton County Stadium on December 15, 1991. The following year they moved into the Georgia Dome. 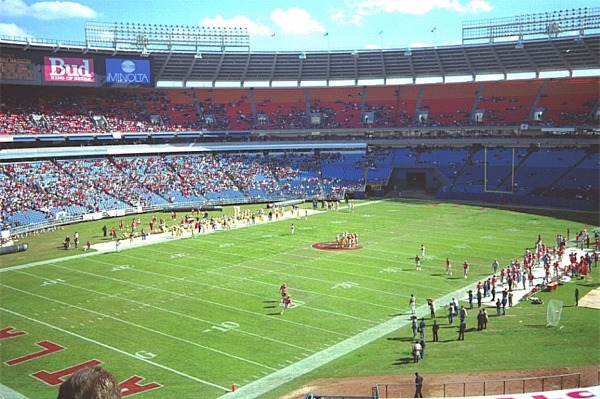 The Braves continued playing at the stadium until the end of the 1996 season. On August 2, 1997, Atlanta Fulton County Stadium was imploded. It is now the site of a parking lot for the Braves current home, Turner Field.